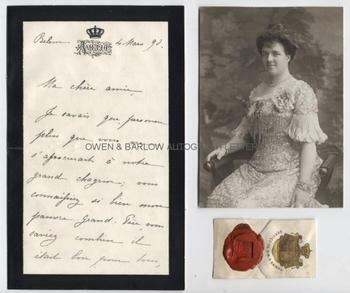 PRINCESS AMELIA OF ORLEANS Autograph Letter Signed. Last Queen of Portugal . ALS. 3pp. Belem [Brazil]. 4th March 1890. To 'Ma Chere ami' (my dear friend). Together with a contemporary portrait photograph and the queen's seal. Text in French. To an unnamed Baron. The queen tells him how she understands his appreciation of their great sorrow and the magnitude of the great and cruel loss that they have undergone. She talks about her Grand-mother and the effect on her. She adds that what he tells her of her brother gives her great pleasure and that they can all be proud of him. Yes, he has done his duty as a nobleman. He is simply a prince and a Frenchman and has won over all hearts. She says that the King has asked her to pass on his best regards, etc. 8vo. Approx 8 x 5 inches. Mounting residue to the blank verso of last leaf, else fine. The portrait photograph of Princess Amelia measures approx. 5.75 x 4 inches and shows her half-length seated. There is mounting residue to the verso but the image is in fine condition. Princess Amelia was a princess by birth and was the eldest daughter of Prince Philippe of Paris and Princess Marie Isabelle of Orleans. In 1886 she married Carlos, Prince Royal of Portugal, who subsequently became Carlos 1st of Portugal. Carlos 1st was murdered by an assassin in 1908 and the heir to the throne, Prince Dom Louis, was also mortally wounded. Princess Amelia, although she attempted to shield her children from the assassin was unharmed and survived the incident. In the revolution of 1910, Queen Amelia left Portugal and went into exile in France. The monarchy was never restored and Amelia was the last Queen of Portugal. The letter probably refers to the death of Luis I, her father in law, which had taken place a few months earlier and to her brother, Prince Philippe, Duke of Orleans, the Orleanist claimant to the French throne, who in contravention of the terms of his exile, had entered Paris in February 1890, offering to do military service. Instead, he was arrested and imprisoned in Clairvaux.